created. This lake includes three main arms with the main body of the lake measuring 18 miles long and one mile wide. 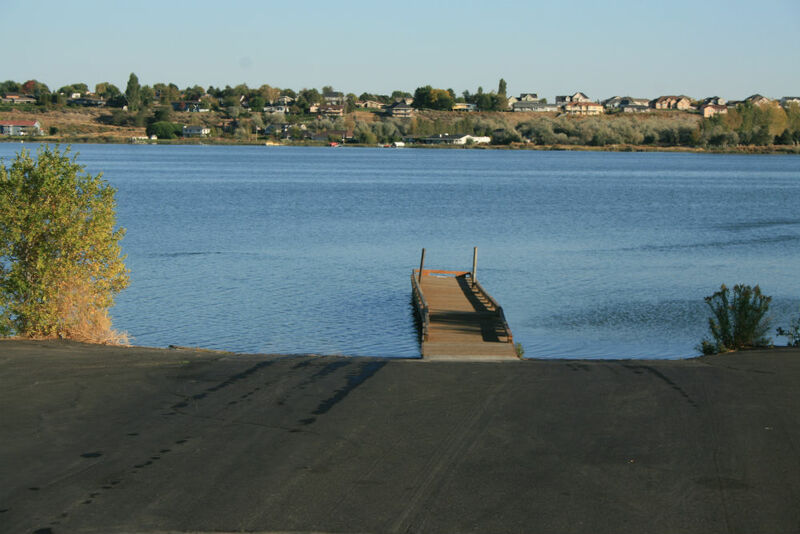 The town of Moses Lake was created shortly after the creation of Moses Lake, which is now the largest city in Grant County. To the south of the lake is the Potholes Reservoir that is connected to the lake via two spillways that turn into challenges that bring water to Potholes Reservoir. 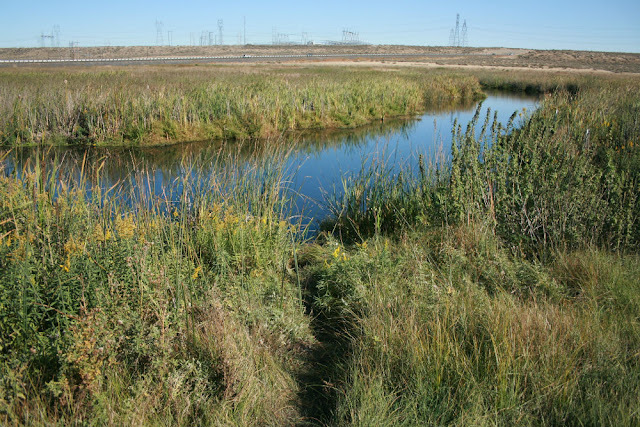 Also to the south is the Columbia National Wildlife Refuge and Sheep Lake area that were also created by the project, that now include many small and large lakes, and canals. 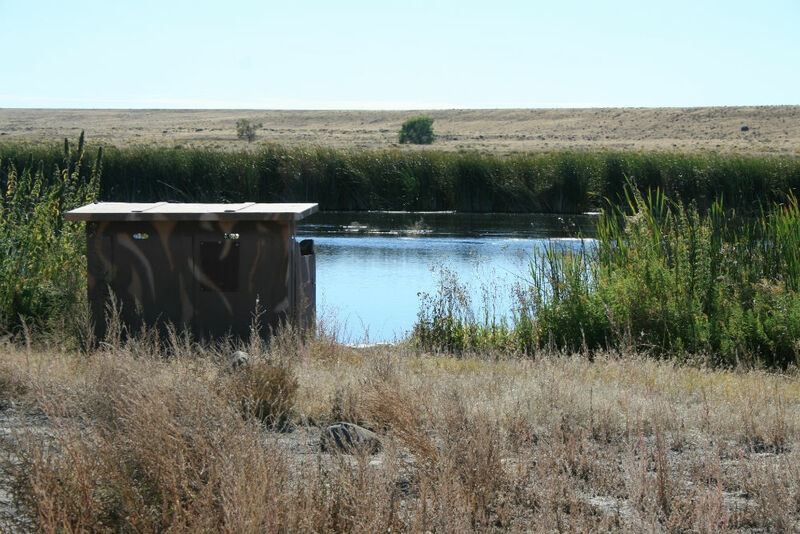 Migratory birds make this area its home, along with many species of natural fauna. On the shores of the lake there are many boat launches and access points. With some effort one can paddle from the northernmost point of the lake, to its southern point, portage into the canals leading to Potholes Res., then go through the reservoir, portage around the O'Sullivan Dam into the Potholes Canal, pass through the chain lakes and end up in Othello, WA. a 50 mile paddle trip. Directions: Moses Lake (the lake not the city) is right off of I90 via exits 174, 176, and 179. Maps: See printable lake map below. To view a google map visit google.com/maps and type in Moses Lake, Grant County, WA. We placed this creek access information here as a little note of interest. 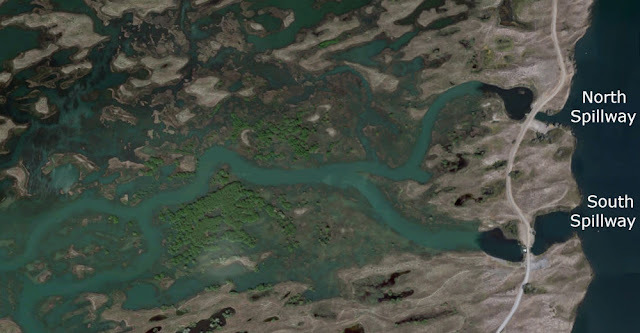 This creek is at the northernmost tip of Moses Lake. There is a small dam with associated spillway that backs up the water of this creek a little to creates its little own reservoir with marsh that did not exist of course before this dam was built. ACCESSIBILITY: PARKING... Gravel, sand, dirt combo parking area; PATHS/TRAILS... One dirt/mud road that travels down along the creek, then to enter the water its via narrow paths through the creek side vegetation. Walk-in only. This road and path is not accessible to wheeled mobility devices; RESTROOMS/FACILITIES/SHADE… None. No designated picnic areas or shaded area. No trees; DOCKS/LAUNCHES/PLATFORMS… One narrow gravel/dirt/mud launch area through marine vegetation; DIRECT WATER ACCESS… No access for wheeled mobility devices; TRANSFER SYSTEMS... None; SENSORY... No sensory tactile markers for those with visual and other impairments; CAMPING... No; O.T.H.E.R… Oddities/Barriers: Lots marine vegetation along the shoreline making access difficult. Lots of sand and deep mud during wet times of the year along shoreline; Terrain: Level to about 5% grades; H2O/Water: Water normally murky. Water temperature in the summer can be around 60 to 70 degree. Drinking water not available; Environmental Conditions: High winds and hot summer temperatures; Resources: Food, drinks, and gas in city of Moses Lake. ACCESSIBILITY: PARKING... Sand, dirt combo parking at the end and along the road; PATHS/TRAILS... Dirt/mud access to the reservoir at the small building on the shoreline and at other areas where the marine vegetation is less. Walk-in only; RESTROOMS/FACILITIES/SHADE… None. No designated picnic areas or shaded area. No trees; DOCKS/LAUNCHES/PLATFORMS… Several narrow sand/dirt/mud landing areas through marine vegetation; DIRECT WATER ACCESS… No access for wheeled mobility devices; TRANSFER SYSTEMS... None; SENSORY... No sensory tactile markers for those with visual and other impairments; CAMPING... None; O.T.H.E.R… Oddities/Barriers: Lots marine vegetation along the shoreline making access difficult. Lots of sand and deep mud during wet times of the year along shoreline; Terrain: Level to about 5% grades; H2O/Water: Water normally murky. Water temperature in the summer can be around 60 to 70 degree. Drinking water not available; Environmental Conditions: High winds and hot summer temperatures; Resources: Food, drinks, and gas in city of Moses Lake. There are technically 11 access sites on this lake 6 of which are paved boat launches. This is your guide below in accessing Moses Lake. On a side note there are many other sites where you could access the lake with a kayak/canoe that are two many to be listed here. He have put the most popular kayak/canoe access sites in the list below. ACCESSIBILITY: PARKING... Large gravel parking lot; PATHS/TRAILS... None; RESTROOMS/FACILITIES/SHADE… Fully accessible restroom. No designated picnic areas or shaded area. No trees; DOCKS/LAUNCHES/PLATFORMS… No docks. One single lane cement launch pad; DIRECT WATER ACCESS… No access for wheeled mobility devices; TRANSFER SYSTEMS... None; SENSORY... No sensory tactile markers for those with visual and other impairments; CAMPING... No; O.T.H.E.R… Oddities/Barriers: Lots marine vegetation along the shoreline making access difficult other than at launch/designated launch area. Lots of sand and deep mud along shoreline; Terrain: Level to about 3% grade; H2O/Water: Water normally murky. Water temperature in the summer can be around 60 to 70 degree. Drinking water not available; Environmental Conditions: High winds and hot summer temperatures; Resources: Food, drinks, and gas in city of Moses Lake. ACCESSIBILITY: PARKING... Large paved parking lots; PATHS/TRAILS... Paths to restrooms, to bay area where there is a boardwalk around the bay. Large well kept lawn to sandy beach area; RESTROOMS/FACILITIES/SHADE… Fully accessible restroom. Covered picnic areas and shaded area. Lots of trees; DOCKS/LAUNCHES/PLATFORMS… One dock at launch. Double lane paved launch; DIRECT WATER ACCESS… No access for wheeled mobility devices, with assistance one could potentially get to the water via the sandy beach. Beware of mud at or below water level; TRANSFER SYSTEMS... None; SENSORY... No sensory tactile markers for those with visual and other impairments; CAMPING... No. Day use area; O.T.H.E.R… Oddities/Barriers: Lots of rock, sand, and deep mud along shoreline; Terrain: Level to about 5% grade; H2O/Water: Water normally murky. Water temperature in the summer can be around 60 to 70 degree. Drinking water not available; Environmental Conditions: High winds and hot summer temperatures; Resources: Food, drinks, and gas in city of Moses Lake. ACCESSIBILITY: PARKING... Large paved parking lots; PATHS/TRAILS... Paths to restrooms, to picnic areas, to boat launch area. Large well kept lawn in camping area; RESTROOMS/FACILITIES/SHADE… Fully accessible restrooms. Covered picnic areas and shaded area, and cement pads. Lots of trees; DOCKS/LAUNCHES/PLATFORMS… Four docks, two at launch, two in camping area (not access paths to the two docks in the camping area). Double lane paved launch at about 5% grade; DIRECT WATER ACCESS… No access for wheeled mobility devices; TRANSFER SYSTEMS... None; SENSORY... No sensory tactile markers for those with visual and other impairments; CAMPING... Yes on southeast side of park. 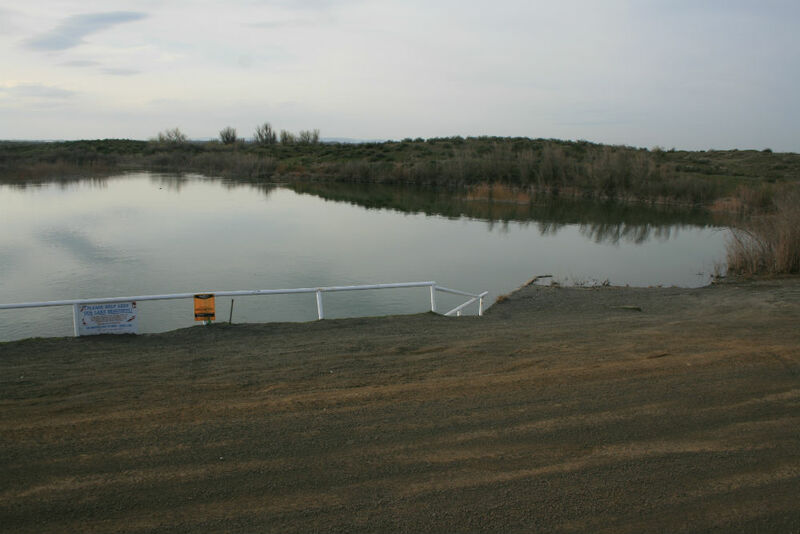 Tent and RV campsites with hookups; O.T.H.E.R… Oddities/Barriers: Lots of rock and deep mud along shoreline; Terrain: Level to about 5% grades; H2O/Water: Water normally murky. Water temperature in the summer can be around 60 to 70 degree. 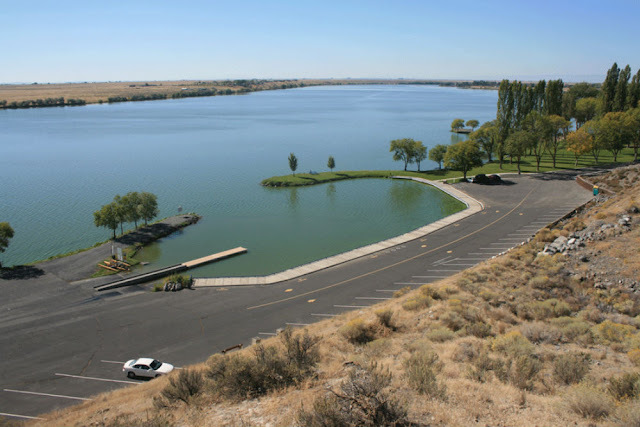 Drinking water available; Environmental Conditions: High winds and hot summer temperatures; Resources: Food, drinks, and gas in city of Moses Lake. ACCESSIBILITY: PARKING... Large paved parking lot along Activity Trail route along shoreline with accessible parking spaces; PATHS/TRAILS... Paths to restrooms, and to access site; RESTROOMS/FACILITIES/SHADE… Some fully accessible restrooms at various businesses near access site. Picnic areas and shaded areas. 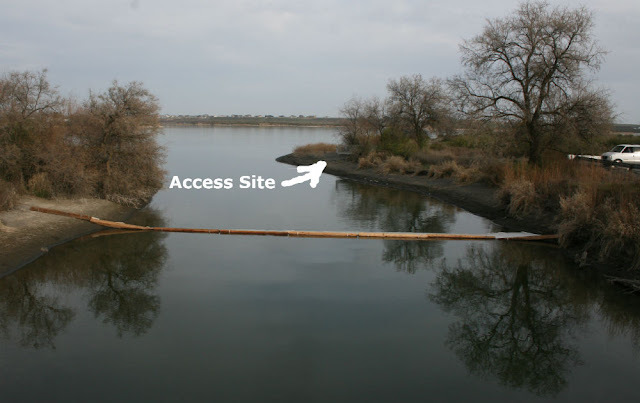 Lots of trees; DOCKS/LAUNCHES/PLATFORMS… One accessible dock at access site; DIRECT WATER ACCESS… No access for wheeled mobility devices; TRANSFER SYSTEMS... None; SENSORY... No sensory tactile markers for those with visual and other impairments; CAMPING... No. Day use area; O.T.H.E.R… Oddities/Barriers: Lots of rock and deep mud along shoreline; Terrain: Level to about 3% grade; H2O/Water: Water normally murky. Water temperature in the summer can be around 60 to 70 degree. Drinking water available; Environmental Conditions: High winds and hot summer temperatures; Resources: Food, drinks, and gas in nearby at this site. 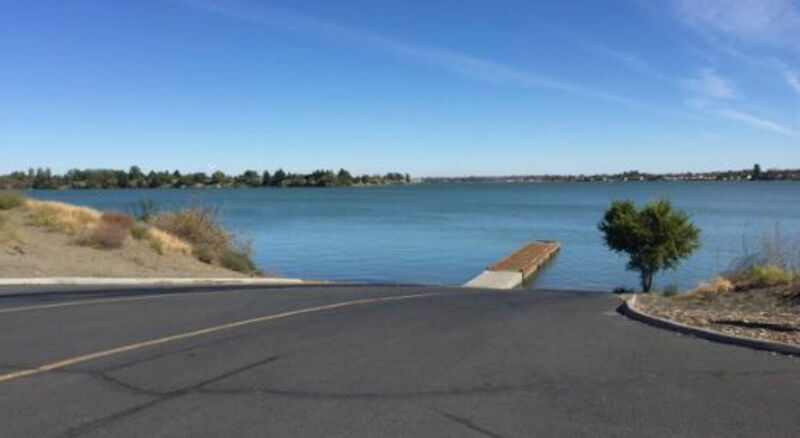 This is the most elaborate park in the Moses Lake area that includes a water park with Olympic pool, etc., tennis and basketball courts, cover picnic areas with paved paths throughout the park, restrooms, concert pavilion, and water access for non-motorized craft by hand, with dock. Directions: From HWY 17 turn South onto Stratford Rd NE, Turn right/west onto E Broadway Ave., Turn left/south onto Dogwood Street. Follow this street to the park. Parking in the parking lot in front of the Tennis Court sits furthest back from Dogwood Street. Take the paved path to the left tennis court down to the Concert Amphitheatre. The small dock and access site is to the left of the Amphitheatre next to a small building at the waters edge. ACCESSIBILITY: PARKING... Large paved parking lots; PATHS/TRAILS... Paths to restrooms, to park features. No path to the access site, but there is a large well kept lawn to to this site; RESTROOMS/FACILITIES/SHADE… Fully accessible restroom. Covered picnic areas and shaded areas. Lots of trees; DOCKS/LAUNCHES/PLATFORMS… One dock at access site, launch off of dock. Dock not considered ADA compliant; DIRECT WATER ACCESS… No access for wheeled mobility devicesl; TRANSFER SYSTEMS... None; SENSORY... No sensory tactile markers for those with visual and other impairments; CAMPING... No. Day use area; O.T.H.E.R… Oddities/Barriers: Lots marine vegetation along the shoreline making access difficult other than at dock access site. Lots of rock, sand, and deep mud along shoreline; Terrain: Level to about 5% grade; H2O/Water: Water normally murky. Water temperature in the summer can be around 60 to 70 degree. Drinking water not available; Environmental Conditions: High winds and hot summer temperatures; Resources: Food, drinks, and gas nearby this park. ACCESSIBILITY: PARKING... Large paved parking lot; PATHS/TRAILS... Paths to restrooms and long mooring dock. 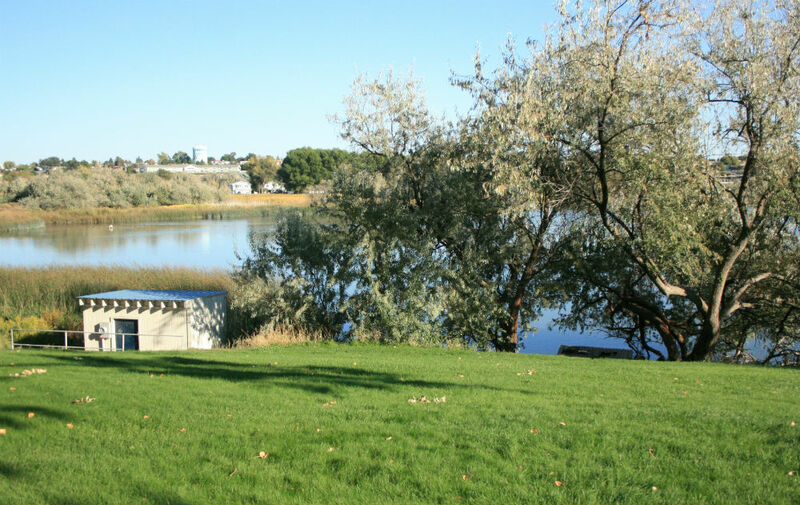 Large well kept lawn to sandy/mud beach area and launch dock; RESTROOMS/FACILITIES/SHADE… Fully accessible restroom. Picnic areas and shaded areas. Lots of trees; DOCKS/LAUNCHES/PLATFORMS… Two docks, one at launch and another near launch for mooring. Double lane paved launch at 5% grade; DIRECT WATER ACCESS… No access for wheeled mobility devices, with assistance one could potentially get to the water via the sandy/mud beach. Beware of mud at or below water level; TRANSFER SYSTEMS... None; SENSORY... No sensory tactile markers for those with visual and other impairments; CAMPING... No. Day use area; O.T.H.E.R… Oddities/Barriers: Patches of marine vegetation along the shoreline. Lots of rock, sand, and deep mud along shoreline; Terrain: Level to about 5% grade; H2O/Water: Water normally murky. Water temperature in the summer can be around 60 to 70 degree. Drinking water not available; Environmental Conditions: High winds and hot summer temperatures; Resources: Food, drinks, and gas in city of Moses Lake. ACCESSIBILITY: PARKING... Large paved parking lots on include of about 5% grade; PATHS/TRAILS... No official paths. Small well kept lawn that does not give access to the water; RESTROOMS/FACILITIES/SHADE… Fully accessible restroom in strange location out of parking lot along the access road. Picnic area in shaded area. A few large trees; DOCKS/LAUNCHES/PLATFORMS… One dock at launch. Double lane paved launch with center dock. The launch area is wide beyond the double lane launch making it easy to launch non-motorized craft when the boat launches are busy; DIRECT WATER ACCESS… No access for wheeled mobility devices, with assistance one could potentially get to the water on either side of the launch area when no powerboats present. Beware of mud at or below water level; TRANSFER SYSTEMS... None; SENSORY... No sensory tactile markers for those with visual and other impairments; CAMPING... No. Day use area; O.T.H.E.R… Oddities/Barriers: Lots of rock, sand, and deep mud along shoreline; Terrain: Level to about 5% grade; H2O/Water: Water normally murky. Water temperature in the summer can be around 60 to 70 degree. Drinking water not available; Environmental Conditions: High winds and hot summer temperatures; Resources: Food, drinks, and gas in city of Moses Lake. ACCESSIBILITY: PARKING... Large paved parking lots; PATHS/TRAILS... Paths to restrooms, fishing dock, and park area. Large well kept lawn to sandy beach area; RESTROOMS/FACILITIES/SHADE… Fully accessible restroom. Covered picnic areas and shaded areas. Lots of trees; DOCKS/LAUNCHES/PLATFORMS… Two docks at launch and one on the other side for fishing with paved access path. 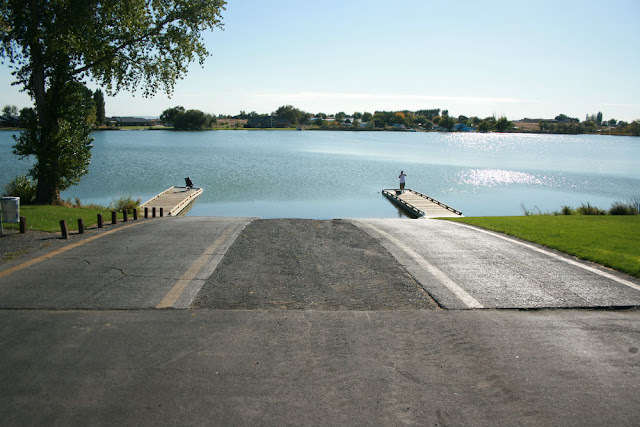 Double lane paved launch with center launch dock; DIRECT WATER ACCESS… No access for wheeled mobility devices, with assistance one could potentially get to the water via the sandy beach. Beware of mud at or below water level; TRANSFER SYSTEMS... None; SENSORY... No sensory tactile markers for those with visual and other impairments; CAMPING... No. Day use area; O.T.H.E.R… Oddities/Barriers: Lots of rock, sand, and deep mud along shoreline; Terrain: Level to about 5% grade; H2O/Water: Water normally murky. Water temperature in the summer can be around 60 to 70 degree. Drinking water available; Environmental Conditions: High winds and hot summer temperatures; Resources: Food, drinks, and gas in city of Moses Lake. ACCESSIBILITY: PARKING... Large sandy parking area; PATHS/TRAILS... No paths. Entire area is sand, but road is gravel sand combo; RESTROOMS/FACILITIES/SHADE… Fully accessible restroom. No covered picnic areas and shaded areas. No trees; DOCKS/LAUNCHES/PLATFORMS… No docks or launch. Launching is done off the large sandy beach (beware of getting stuck, 4x4 needed. Hand launching is best; DIRECT WATER ACCESS… No access for wheeled mobility devices, with assistance one could potentially get to the water via the sandy beach. Beware of mud at or below water level; TRANSFER SYSTEMS... None; SENSORY... No sensory tactile markers for those with visual and other impairments; CAMPING... Primitive camping allowed in the area; O.T.H.E.R… Oddities/Barriers: Lots sand and mud; Terrain: Level to about 10% grade on some of the big dunes; H2O/Water: Water normally murky. Water temperature in the summer can be around 60 to 70 degree. Drinking water not available; Environmental Conditions: High winds and hot summer temperatures. 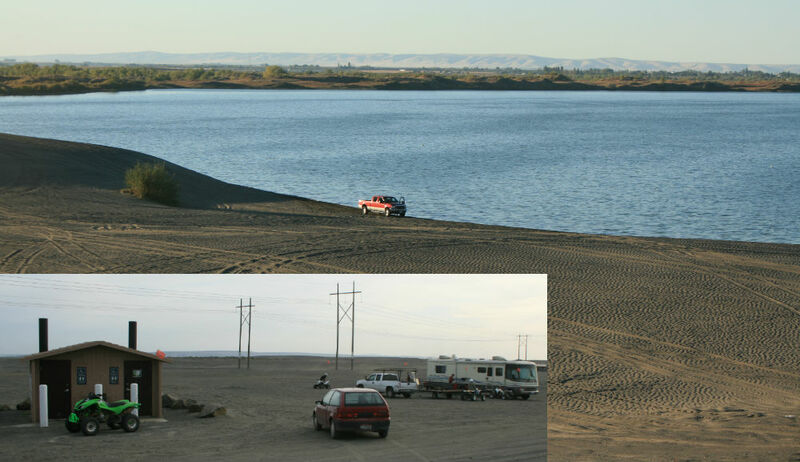 Sand gets into everything; Resources: Food, drinks, and gas in city of Moses Lake. Kayakers/Canoeist used this site to launch into the canals that lead into the Potholes Reservoir area, giving access to hundreds of sand islands and for great fishing and wildlife viewing. 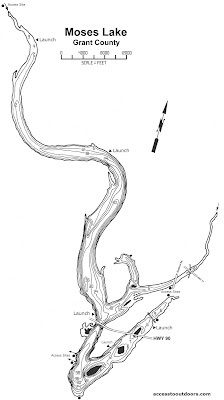 One can launch at the spillways into Moses lake also. Be cautious of the high currents particularly during spring runoff. Obey any spillway rules, and stay away the ingoing current so you are not accidently pulled into the spillways. ATTENTIONS... 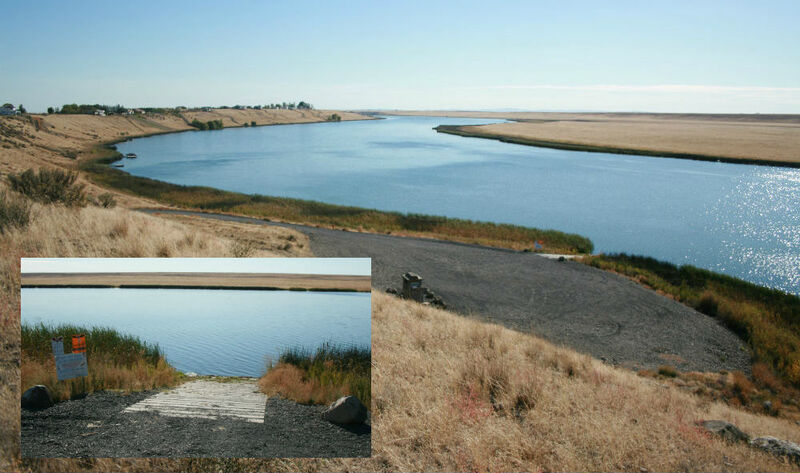 The north or south spillways work equally well for entering and exiting via the bank from or into Moses Lake, but the North Spillway is be best place to put-in/launch into Potholes Canals and into the reservoir via the canal. ACCESSIBILITY: PARKING... Large gravel parking lot; PATHS/TRAILS... Short paved path to a fishing platform. From this paved path is a narrow dirt trail to the lake that is used by those launching their kayak, etc. into the lake. This trail is not accessible to wheeled mobility devices; RESTROOMS/FACILITIES/SHADE… Fully accessible restroom next to parking lot. No picnic areas but there is some shade from trees on the paved path to the fishing platform. A few trees along the parking lot; DOCKS/LAUNCHES/PLATFORMS… No dock or formal launch, or proper access for wheeled mobility devices. 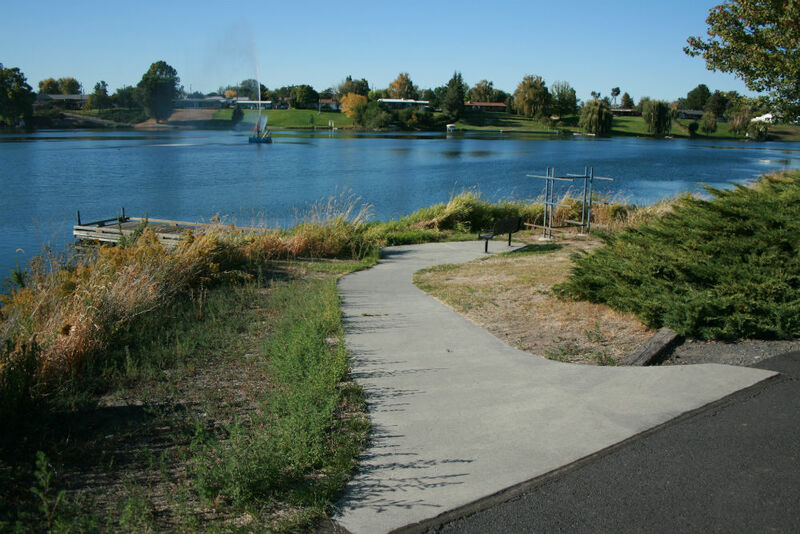 Launch off of bank into lake, or via wide gravel area next to spillway into the canal; DIRECT WATER ACCESS… No access for wheeled mobility devices, with assistance one could potentially get to the water in the canal via the wide gravel launch area next to the dam. Beware of mud at or below water level; TRANSFER SYSTEMS... None; SENSORY... No sensory tactile markers for those with visual and other impairments; CAMPING... No. Day use area; O.T.H.E.R… Oddities/Barriers: Lots marine vegetation along the shoreline making access difficult other than at launch/designated launch area. Lots of rock, sand, and deep mud along shoreline; Terrain: Level to about 5% grade; H2O/Water: Water normally murky. Water temperature in the summer can be around 60 to 70 degree. Drinking water not available; Environmental Conditions: High winds and hot summer temperatures, and high currents at spillways and in canal; Resources: Food, drinks, and gas in city of Moses Lake. ACCESSIBILITY: PARKING... Large gravel parking lot; PATHS/TRAILS... Narrow dirt trail to the lake that is used by those launching their kayak, etc. into the lake. This trail is not accessible to wheeled mobility devices; RESTROOMS/FACILITIES/SHADE… Fully accessible restroom next to parking lot. No picnic areas or shade. 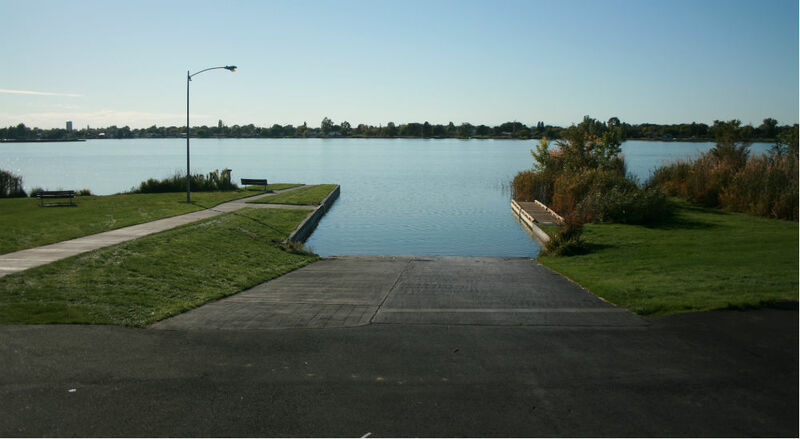 No trees; DOCKS/LAUNCHES/PLATFORMS… No dock or formal launch, or proper access for wheeled mobility devices. Launch off of bank into lake, or via wide gravel area next to spillway into the canal; DIRECT WATER ACCESS… No access for wheeled mobility devices; TRANSFER SYSTEMS... None; SENSORY... No sensory tactile markers for those with visual and other impairments; CAMPING... No. Day use area; O.T.H.E.R… Oddities/Barriers: Lots marine vegetation along the shoreline making access difficult other than at launch/designated launch area. Lots of rock, sand, and deep mud along shoreline; Terrain: Level to about 7% grade; H2O/Water: Water normally murky. Water temperature in the summer can be around 60 to 70 degree. 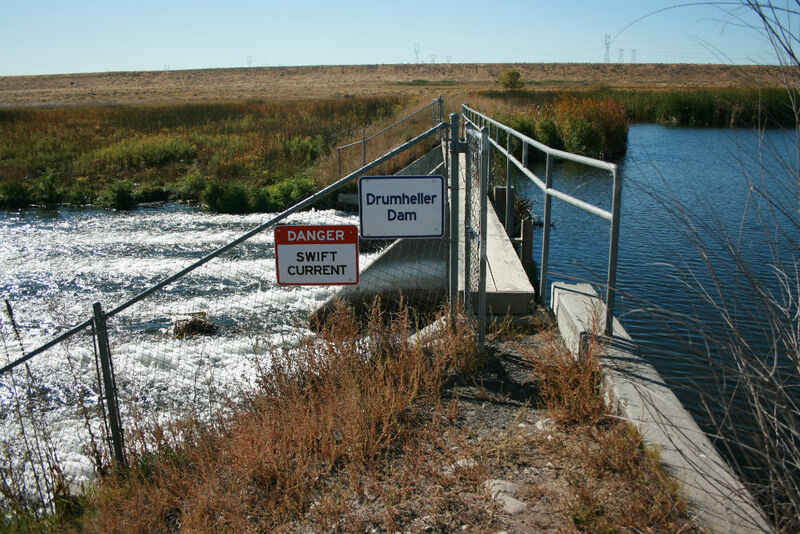 Drinking water not available; Environmental Conditions: High winds and hot summer temperatures, and high currents at spillways and in canal; Resources: Food, drinks, and gas in city of Moses Lake.